At 13.00 on a grey afternoon in November 2006, thanks to some local friends and the internal authority, we succeeded in obtaining a Pass to visit the port, with an obligation not to photograph which we respected however we couldn't understand what there was to hide. We entered from the foreigners' access escorted by an official of the customs and with courtesy, acted as our guide and took us around in his car. At the start of the tour of the port, from a quick glance, it is very big. Numerous freight ships were docked, large and small, but the thing that gives you a huge impression, are the mountains of steel ready to be loaded. 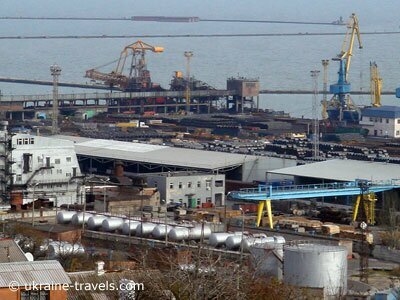 Thousands of tonnes come from the large Azov Stal steelworks. The port is subdivided into 14 docks and each one of these have tens of cranes, continously working to prepare the merchandise. Work shifts are continuous, 24 hours on 24 with many workers. The photographic reportage was possible from outside the port but from high points that allowed a discreet visual angle also in the particulars. The port has a good appearance, very tidy and you will note an optimal organisation. Loading Zone The first part is reserved to ceramics, mountains of ceramic dust ready to be sent to miscellaneous world ports. Then the coal sector, as we know the Donbass zone is rich with coal mines. In this sector there are more loading systems. The coal in large sizes, arrive with the merchandise wagons. each wagon makes, with means of assigned staff, a drawing of samples that are analysed and if conform to the required requirements, have no impediments for the loading docks. The coal can finally go instead, after the usual control, on the conveyor belts which arrive directly to the holds of the freight boats. The docks We arrive at dock 10 which is reserved to load metal, after having passed the other docks which one notes there are also other materials, like wood but in minor quantities. Dock 10 seems to be the centre of sorting steel and here, there are really incredible mountains from which there are also blocks of cast iron ready for fusion. The sea depth in the port is not such to allow complete loading on the boats therefore the merchandise is loaded in other ports on the Black Sea like Odessa. Still to note, during winter, in general particularly harsh, the surface of the sea is completely iced over but Mariupol Port has also, from its numerous service boats, an optimal Icebreaker that allows the port to work during this time of the year. Our visit ended here, thanks to the Mariupol Port authority that gave permission to this interesting tour inside the port. 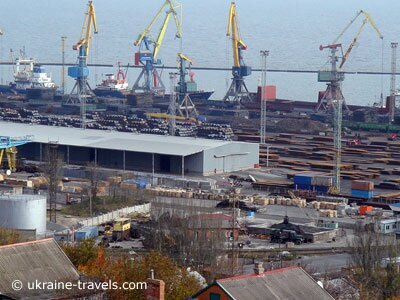 For more information, you will find this on the official website of Mariupol Port (in Russian and English) Marport. Opens with the merchandise trains which arrive at the port loaded with iron, coal and other materials. Some images of the port. Some historical photos of Mariupol port, the first is in1900 and the second in1901.